Preparedness Tip #1: Make an Emergency Kit! An emergency kit is simply a collection of basic items you may need in the event of an emergency. The items in this kit will be necessary if you will need to shelter-in-place or evacuate. 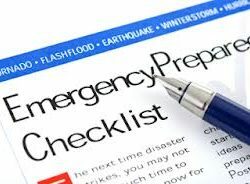 Assemble your kit well in advance of an emergency, and update annually. Store supplies in an easy-to-carry containers, such as backpacks or duffle bags. Change of clothing, rain gear, and sturdy shoes for every person in your household. Preparedness Tip #2: Make an Emergency Plan!